Shri Brahma Ji came to Shri Vishnu Ji. At that time Shri Vishnu Ji along with Lakshmi was sleeping on the snake bed. Servants were also sitting next to them. Shri Brahma Ji said to Shri Vishnu Ji, "Son, get up. See, your father has come. I am your Lord." On this Vishnu Ji said, "Come, sit. I am your father. Why has your face become crooked?" Brahma Ji said - Oh Son! Now you have become arrogant; I am not only your guardian, but am the father of the entire universe. Shri Vishnu Ji said, "Oh thief! What superiority are you boasting of? The entire universe resides in me. You originated from the lotus on my navel, and are talking like this to me only." After saying this, both the gods started fighting with each other with weapons. They attacked on each other's chest. 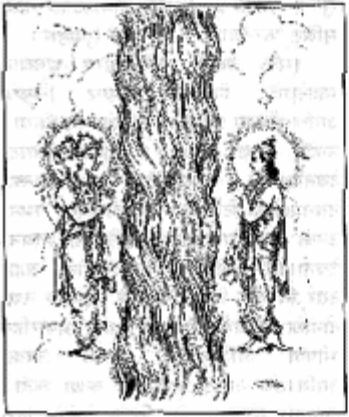 On seeing this SadaShiv (Kaalform Brahm) placed a bright ling (phallus) between the two; then their fight stopped. Please think: In Shri Shiv Puran, Shri Vishnu Puran and Shri Brahm Puran and Shri Devi MahaPuran, there are descriptions of the divine acts (leela) of the lives of the three gods and SadaShiv (Kaal-form Brahm) and Devi (Shiva / Prakriti). Based on these only, all the sages and gurus used to deliver knowledge. If someone imparts knowledge different from the Holy Purans, then because of being opposite to the syllabus, it is useless. The description of the above-mentioned fight is from Holy Shiv Puran, in which both the gods are quarrelling like five-year-old kids. They say that you are my son, the second one says, "You are my son; I am your father." Then holding each other's collar, fight by punching and kicking. The same is the character of the lords of the three loks.